The Perfect End-of-Summer, Family-Friendly Event! With summer quickly coming to a close, there is no better time to visit Rip Van Winkle Campgrounds than now! Every weekend, there is a new, fun and exciting event to look forward to. Quickly creeping up is the annual Ulster County Fair from August 4 - 6. Since 1886, New Paltz, N.Y. has hosted the famous Ulster County Fair, a family-favorite summer event that you simply won't want to miss. 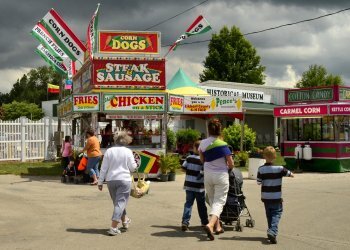 The Fair has a little something for everyone to enjoy including daily entertainment, headlining acts, agricultural exhibits, amusement rides, refreshing drinks, delicious local cuisine and fireworks shows to wrap up each day. Kids will love attractions like the Butterfly Experience, Robinson's Racing Pigs and the Two-by-Two Petting Zoo. This year's headliners include Thunder Ridge, Billy Bob Thornton and the Boxmasters, The Charlie Daniels Band, Keith Anderson, Jenny Tolman, Cale Doods and Journey's former lead vocalist, Steve Augeri. The Ulster County Fair is the perfect family-friendly event for you to enjoy. So end your summer with a bang as we invite you to come and stay with us for the entire weekend so you can truly take in all that this exciting event has to offer! For more information, feel free to explore our events page or the Ulster County Fair website here.